This photo (from Wikipedia) is a screenshot of Rutger Hauer in the film, Soldier of Orange/Soldaat van Oranje. The real Soldier of Orange died this week. Erik Hazelhoff Roelfzema was a man who lived a romantic, somewhat reckless, and somewhat peripatetic life, and was indeed fortunate to survive into old age. Movies always make things seem more glamorous than they are, but c'mon: smuggling radio equipment into the Netherlands by boat, shuttling resistance leaders back and forth across the English Channel; flying bombing missions with the RAF; earning the highest military honor for bravery in battle; becoming close friends with the royal house; it's an amazing story. Like the hero of "Europa, Europa" in some ways. As an appendix, I highly recommend Soldaat van Oranje, which is debatably the best Dutch film there is (though debatably there's not a lot of competition). But Paul Verhoeven is, in my opinion, an underrated director, and this is his best work. Yes, better than "Turkish Fruit," not to mention "Starship Troopers" and "Robocop." The photo above shows the war hero face to face with the collaborator; but the film itself is subtle. People make difficult choices, and live and die by them. The ending of the movie is one of the ultimate expressions of the Dutch national character: Rutger Hauer drinks a glass of wine with an old school buddy who basically just sat out the war without doing anything. 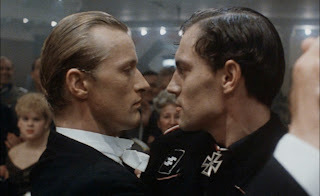 He says something to Hauer (Roelfzema) like "gosh, did all those things really happen to you?" I find that Verhoeven would end on that note so typically Dutch. Critical, self-critical, realistic in appraisal of his countrymen. Most of us are not heroes nor villains; and most Dutch who 'just followed orders' in shipping off Jews to the camps weren't either. They just watched as history went by. Secondarily, I notice that Google has this story hosted on its own site. Is this Armageddon for AP's newspaper customers/owners?